1 Transfusion in the New Millennium: Ennio C. Rossi and Toby L. Simon. Section I. Blood Components and Derivatives. Part I. Red Blood Cells. 2 Red Cell Production and Kinetics: Mark J. Koury. 3 Regulation of Oxygen Delivery by Red Cells and Red Cell Substitutes: Christopher P. Stowell. 4 Red Blood Cell Metabolism and Preservation: Bjarte G. Solheim and John R. Hess. 5 Red Cell Immunology and Compatibility Testing: W. John Judd. 6 Carbohydrate Blood Groups: Eldad A. Hod, Patrice Spitalnik and Steven L. Spitalnik. 7 Rh and LW Blood Groups: Connie M. Westhoff and Don L. Siegel. 8 Other Protein Blood Groups: Petr Jarolim. 9 Anemia and Red Blood Cell Transfusion: Jeffrey L. Carson and Paul C. Hébert. 10 Platelet Production, Kinetics, and Hemostasis: Henry M. Rinder and Aaron Tomer. 11 Platelet Immunology and Alloimmunization: Brian R Curtis and Janice G. McFarland. 12 Preparation, Preservation, and Storage of Platelet Concentrates: Ralph R. Vassallo, Jr.
13 Thrombocytopenia and Platelet Transfusio: Peter W. Marks. Part III. White Blood Cells. 14 Neutrophil Production and Kinetics: Neutropenia and Neutrophilia: Thomas H. Price. 15 Neutrophil Collection and Transfusion: Ronald G. Strauss. 16 Leukocyte-Reduced Blood Components: Laboratory and Clinical Aspects: Darrell J. Triulzi and Walter H. Dzik. 17 Composition and Mechanisms of Blood Coagulation and Fibrinolysis: Peter Hellstern. 18 Immunoglobulins: Urs E. Nydegger. 19 Preparation and Use of Plasma Derivatives: Toby L. Simon, Kirsten Seidel and Albrecht Gröner. 20 Plasma Transfusion and Use of Albumin: Simon J. Stanworth and Alan T. Tinmouth. 21 Applications of Cellular Radiolabeliing in Transfusion Medicine: Larry J. Dumont, James P. AuBuchon and Richard J. Davey). 22 Autoimmune Hemolytic Anemia and Paroxysmal Noctural Hemoglobinuria: Thomas P. Duffy. 23 Management of Immune Thrombocytopenias: Donald M. Arnold, James W. Smith and Theodore Warkentin. 24 Bleeding from Acquired Coagulation Defects and Antithrombotic Therapy: Thomas J. Raife, Jeffry S. Rose and Steven R. Lentz. Part II. Obstetric and Pediatric Patients. 25 Fetal and Neonatal Hematopoiesis: Robert D. Christensen and Martha C. Sola-Visner. 26 Obstetric Transfusion Practice: Humphrey H.H. Kanhai, Jos J.M. van Roosmalen and Anneke Brand. 27 Hemolytic Disease of the Newborn: Bjarte G. Solheim and Morten Grönn. 28 Congenital Disorders of Clotting Proteins and Hypercoagulable States in Pediatrics: Linda J. Butros and Prasad Mathew. 29 Management of Congenital Hemolytic Anemias: Bruce I. Sharon. 30 Blood Component Transfusions for Infants: Ronald G. Strauss. 31 Transfusion Support for the Oncology Patient: Christopher A. Tormey and Edward L. Snyder. 32 Hematopoietic Growth Factors (Cytokines): W. Conrad Liles and David C. Dale. 33 Hematopoietic Progenitor Cells: Biology and Processing: Thomas Leemhuis and Ronald A. Sacher. 34 Hematopoietic Progenitor Cells: Autologous Transplantation: Hooman H. Rashidi and Scott D. Rowley. 35 Hematopoietic Progenitor Cells: Allogeneic Transplantation: Amin M. Alousi and Sergio A. Giralt. 36Umbilical Cord Blood: A Reliable Source of Stem and Progenitor Cells for Human Transplantation: Suhag H. Parikh and Joanne Kurtzberg. 37 Alternatives to Transfusion: Perioperative Blood Management: Lynne Uhl. 38 Blood Components to Achieve Hemostasis for Surgery and Invasive Procedures: Walter H Dzik. 39 Transfusion Therapy in the Care of Trauma and Burn Patients: Ellen C. Omi and Richard L. Gamelli. 40 Transfusion Therapy in Solid-Organ Transplantation: Glenn Ramsey. 41 Apheresis: Principles and Technology of Hemapheresis: Ronald O. Gilcher and James W. Smith. 42 Therapeutic Plasma Exchange Bruce C. McLeod. 43 Specialized Therapeutic Hemapheresis and Phlebotomy: Robert Weinstein. Section IV. Hazards of Transfusion. 44 Overview of Hemovigilance: Dorothy Stainsby, Jean-Claude Faber and Jan Jørgensen. 45 Immunomodulatory and Proinflammatory Effects of Allogeneic Blood Tranfusion: Eleftherios C. Vamvakas, José O. Bordin and Morris A. Blajchman. Part II. Infectious Hazards of Transfusion. 46 Transfusion-Transmitted Hepatitis: Harvey J. Alter and Juan I. Esteban-Mur. 47 Retroviruses and Other Viruses: John A. J. Barbara and Brian Dow. 48 Transfusion Transmission of Parasites: Bryan R. Spencer. 49 Bacterial Contamination of Blood Products: Yara A. Park and Mark E. Brecher. 50 Prion Diseases: Marc L. Turner. 51 Pathogen Inactivation: Bjarte G. Solheim and Jerard Seghatchian. Part III - Noninfectious Hazards. 52 Hemolytic Transfusion Reactions: Robertson D. Davenport. 53 Febrile, Allergic, and Nonimmune Transfusion Reactions: Gregory J. Pomper. 54 Transfusion-Associated Graft-vs-Host Disease: John E. Levine and James L. M. Ferrara. 55 Tranfusional Iron Overload: Sujit Sheth. 56 Transfusion-Related Acute Lung Injury: Jonathan P. Wallis and Ulrich J. H. Sachs. Section V. Cell and Tissue Therapy. 57 HLA Antigens and Alleles: Thomas M. Williams. 58 Tissue Banking: Jeanne V. Linden, William F. Zaloga and A. Bradley Eisenbrey. 59 Adoptive Immunotherapy: Catherine M. Bollard and Helen Heslop. 60 Gene Therapy in Transfusion Medicine: Emanuela M. Bruscia and Diane S. Krause. 61 Tissue Engineering and Regenerative Medicine: Clay Quint and Laura Niklason. Section VI. Delivery of Transfusion and Transplantation Services. 62 Recruitment and Screening of Donors and the Collection, Processing, and Testing of Blood: Kendall P Crookston, Susan L. Wilkinson and Toby L. Simon. 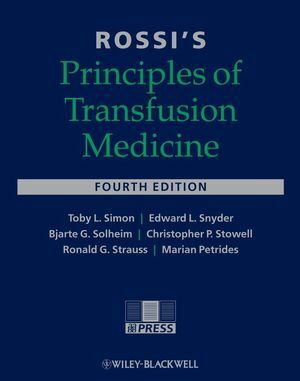 63 Current Legal Issues in Transfusion Medicine: Edward M. Mansfield, Thomas K. Berg, Kurt A. Leiheit, John Parker Sweeny and P. Robert Rigney. 64 Current Good Manufacturing Practice: P Ann Hoppe and Sheryl A. Kochman. 65 Transplant Organizations and Networks in the Regulation of Cellular Therapy Programs: Dennis L. Confer. 66 Hospital Transfusion Committee and Quality Assurance: Pamela Clark and Paul D. Mintz. Companion PC and Mac Compatible CD-ROMs. CD-ROM 1: All chapters of the book with a full text search function. 1 Posttransfusion Hemolysis: Marian Petrides and Nicole A. Pele. 2 Child with Low Fibrinogen: Marian Petrides and Donna Castellone. 3 Head Injury, Sudden Dyspnea: Marian Petrides. 4 A Transfusion Fatality: Marian Petrides. 5 Platelet Refractoriness: Marian Petrides. 6 An Unexpected Panagglutinin: Marian Petrides. 7 Postsurgical Bleeding: Marian Petrides. 8 Jehovah's Witness Surgery: Christopher P. Stowell and Marian Petrides. 9 Delayed Fever and Dark Urine: Marian Petrides. The most comprehensive and practical reference on transfusion science and medicine available.